This strawberry spinach salad is bursting with sweet, tangy flavor that will leave you craving more long after its gone. These past few weekends have been such a whirlwind of activity. Between Easter, my painting projects (painting ceilings is my new personal hell), having friends in town, and helping my little sis move, I am exhausted. Although hangin’ with my adorable nephew during the move was definitely good times. I can’t even put his cuteness into words! Love that crazy little kiddo. Although the family time has been great, I am long overdue for a relaxing weekend of recipe testing and baking the day away which is the only thing on the agenda for this coming Sunday. Well, that and my latest obsession, hot yoga, but that’s an entirely separate sweat filled topic. In the meantime, I’m going to be out enjoying the summatime weather we’re supposed to be getting this week. 80’s for three days in a row? Yes please! Speaking of summertime – this strawberry spinach salad is the perfect warm weather recipe, complete with juicy, succulent berries, and crisp, fresh greens. This salad is so good that it will quickly become a mandatory BBQ side dish that you’ll find yourself making again and again. Its one of those recipes that after you make it once, your friends won’t let you into the party without it forevermore (consider yourself warned!). Luckily, this strawberry spinach salad is pretty quick and easy to throw together so you can easily satisfy your friends’ requests (demands?) with a side dish that you can prep ahead of those sun filled summertime dinners we all know and love. No matter how many times I make this strawberry spinach salad, this is one food I never get sick of. The sweetness of summer berries pairs perfectly with the saltiness of feta and earthiness of nuts, creating an explosion of flavor that will leave you and your guests hungry for more. I used to make a similar recipe years ago, but the dressing had so much sugar in it that I felt bad serving it. It was straight up spinach laced with diabetes. For everyone’s health I stopped making it, but have been missing that sweet-tart flavor combo ever since. After a few trial and error attempts, I came up with this low-sugar strawberry spinach salad recipe that has all the taste bud stimulating saucy goodness of the original but with half the calories. To get away with this, you need to make sure your strawberries are ripe enough to replace that sugary sweetness the natural way. Also, use good balsamic vinegar. It really makes all the difference in the world in a recipe like this. I actually just got a big bottle at Costco on a whim and let out a big sigh of relief when it passed my stringent taste-test. Goes to show that quality doesn’t always have to be expensive. Add all dressing ingredients to a container with a lid (a small mason jar works well) and shake to mix well. 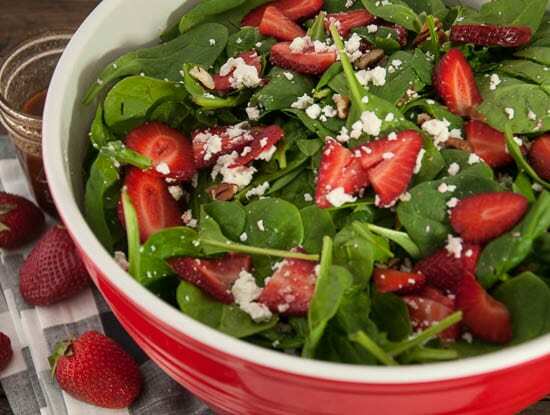 Toss spinach, strawberries, and nuts in a large salad bowl. Toss salad with dressing and feta just before serving. If preparing ahead of time, you will need to re-shake the dressing before adding to the salad since the oil will separate from the vinegar as it sits.